INSPECTORS warned that Northern Ireland’s only high security prison was at risk of “serious disorder or loss of life", according to a highly critical inspection report published today. The damning report into Maghaberry Prison by the Criminal Justice Inspectorate (CJI) found that leadership in the jail failed to ensure it was “safe and stable” and called for urgent action to be taken. The findings relate to an inspection carried out in May. A new governor was appointed to run the prison in August. In a further development, The Detail can also report new figures from the Northern Ireland Prison Service which show that there have been almost 600 incidents of inmate on inmate assaults in Maghaberry Prison over the last five years. In a statement Justice Minister David Ford MLA stated that progress has been made in many areas since the inspection took place in May. He said: “Although there have been many significant developments brought about by the Prison Reform Programme, the conclusions of the Inspection Team show the scale of the challenge. Maghaberry is a very complex prison. “However, in the six months since the inspection, the Prison Service has improved the immediate performance of Maghaberry, as well as putting in place a longer term plan to ensure the prison is delivering better outcomes for prisoners." In May this year representatives from the Criminal Justice Inspectorate and Her Majesty's Inspectorate of Prisons in England and Wales carried out inspections at Maghaberry. While concerns for prision staff are highlighted, the inspectors also said safety had deteriorated and they were “very concerned” about aspects of healthcare and purposeful activity available to prisoners. Before the inspection was carried out in May this year a serious fire was started by prisoners in Maghaberry prison. The Criminal Justice Inspectorate (CJI) said the fire had the potential to cause serious injury or death and have called for an independent review into how management responded to the incident. Inspectors also found that more prisoners than ever before said they felt unsafe. Levels of reported assaults had increased and it was suggested to inspectors by both prisoners and staff that a great deal of physical violence was going unreported. The latest findings come as new figures released to The Detail by the Northern Ireland Prison Service show that there have been almost 600 incidents of inmate on inmate assaults in Maghaberry Prison over the last five years. The table outlines different areas of the main site of Maghaberry Prison where prisoners are located. 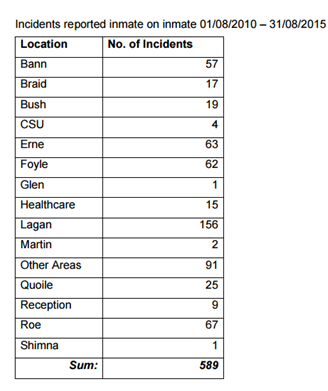 The highest number of assaults occured in Lagan House which consists of around 130 prisoners who are mostly on remand. Separated Republican prisoners are located in Roe House while the cells for Loyalist prisoners are in Bush House. The CJI inspection report highlights that prison staff were also subject to credible threats and some staff in the main prison told inspectors they were fearful of prisoners. Maghaberry Prison was described by inspectors as “a complex and challenging establishment which in some ways is unlike any prison in England and Wales”. The report highlighted the challenges of managing separated paramilitary prisoners and the impact this had on the rest of the prison. Inspectors said the repercussions of operating a separated regime at Maghaberry was having a “significant negative impact” on daily life for the 900 plus men who represent the overwhelming majority of the prison population. CJI said this was an issue the prison service needed to address urgently. A large number of the prison population in Maghaberry have learning difficulties, mental health issues, addiction problems and personality disorders. The Detail has reported extensively on prisons in Northern Ireland including the provision of healthcare, issues facing vulnerable prisoners and several death in custody cases. Click here to read our previous prison investigations. Commenting on the inspection report, inspectors said they were “very concerned that aspects of health care provision had deteriorated since the previous inspection”. The CJI stated that aspects of chronic disease management and substance misuse were unsafe. Inspectors said they met a number of motivated managers and staff who gave them hope that with the right kind of leadership and tangible support, Maghaberry could recover. However the report concluded: “A significant failure in leadership was compounded by an ineffective relationship between Prison Service headquarters and local management which needed to be urgently addressed. Commenting on the Report, Prison Service Director General Sue McAllister said; “This is a disappointing report. The snapshot taken in May demonstrated that Maghaberry had been greatly affected by staff absence which had a serious impact on the regime and outcomes for prisoners. "That has been addressed through robust management of attendance while supporting staff, recruitment of new officers and through redeployment from the other prisons. Since May, sickness levels have fallen sharply which means more officers on the landings and a more progressive and settled regime." As a result of the inspections findings, CJI has said it will revisit Maghaberry prison in January 2016 when it will “expect to see significant progress has been made to address the areas of poor performance identified in this report”.